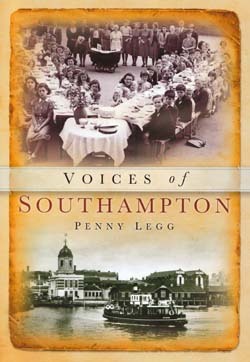 By Penny Legg, is a collection of anecdotes from a wide range of people, who have lived and worked in Southampton for over seventy years. The book is divided up into five chapters, Early Memories; Teenage Years; Educating Southampton; Life in Southampton; and The War Years. The stories are of varying length, some just a few lines, and others a couple of pages. I thoroughly enjoyed reading Voices of Southampton and found myself dipping into it during coffee breaks and quiet moments, and thereby savouring the stories. The book also contains over 80 fascinating photographs and postcards from private collections, which I have never seen before. The strength of this book is found in its simplicity. It's a bit like being at a party listening to a number of interesting local people telling their favourite stories. I'm sure that in years to come local historians will find this book a valuable primary resource. First hand accounts never fail to contain those precious nuggets, which official histories never discover, and Voices of Southampton is no exception. By David Chun is a detailed account of the river and its valley, from prehistoric times to the present day. For most of us, who only glimpse its beauty fleetingly, as we drive along the M27 between junction 8 and 9, this book is a 'must read'. The book is packed with extraordinary information, written by a man with a intimate knowledge and passion for his subject. The Hamble River is 12 miles long, and is prized for its natural beauty. Its source is just north of Bishops Waltham, and it meanders into Southampton Water. Chun knows his stuff, and has read well among primary and secondary sources delving deeply into this 'clay and coppice landscape of wood, water, farmland and heath'. At a time when roads were poor the Hamble River was essential for transportation of flour; timber and coppice wood from the forests. He writes with authority on traditional local industries including hoop making; flour milling; iron production; and ship building. He does this by a mastery of contemporary evidence about life on, and around the river. One of Nelson's flagships, HMS Elephant, was built on the Hamble in the 1800s. The wreck of the Grace Dieu, the biggest medieval ship, lay imbedded in the river mud. The book contains almost 100 illustrations, some of them rarely seen. My favourite is a nineteenth engraving of Botley House, home of local scoundrel Robert Stares, and later occupied by that famous farmer and journalist William Cobbett. Chun weaves these characters into the local landscape in a masterly way. Chun also spotlights the remarkable Hugh Jenkyns, a local landowner, who in the early 20th century was a prime mover in protecting the beauty of the upper river. 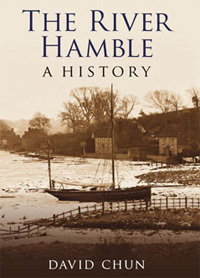 This is a well written and thoughtful account of the Hamble River, which has inspired me to dust off my Ordnance Survey map, and get walking.